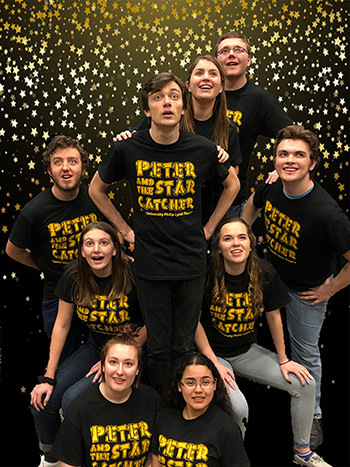 Lewis University’s Philip Lynch Theatre (PLT) will present "Peter and the Starcatcher" a play by Rick Elice ("Jersey Boys" and "Addams Family") based on the 2004 novel by humorist Dave Barry and suspense writer Ridley Pearson. Elice’s play, "Peter and the Starcatcher", received nine 2012 Tony Award nominations (including two for Elice) and won five Tonys. Before Wendy… before he was Captain Hook… before a boy was given the name Peter Pan…and before there was a Neverland, there was a Starcatcher Apprentice named Molly, a pirate named Black Stache, and a nameless orphan…and they are about to be thrown together in a perilous and wildly hilarious adventure on the high seas. But, of course, none of this actually exists, unless you are prepared to use your imagination. In "Peter and the Starcatcher" the play upends the century-old story of how a miserable orphan comes to be The Boy Who Would Not Grow Up, a.k.a. Peter Pan, (Bradford Bingham of Chicago). The show playfully explores the depths of greed, the bonds of friendship, duty, and love. A young orphan and his mates are shipped off from Victorian England to a distant island. At sea, the boys are discovered by a precocious young girl named Molly (Aileen O’Carroll of Orland Park), a Starcatcher-in-training who realizes that the trunk’s precious cargo is starstuff, a celestial substance so powerful that it must never fall into the wrong hands. When the ship is taken over by pirates – led by the fearsome villain Black Stache (Austin Jones of Steger), the journey quickly becomes a thrilling adventure. The production is directed by Theatre Manager and Assistant Professor of Theatre, Jo Slowik of Joliet. Associate Professor of Theatre and technical director, Andrew Nelsen of Joliet designs the lighting and scenery for the magnificent land and sea. Resident costumer Celeste Mackey of Crest Hill, is providing her talents with wardrobe, hairstyles and makeup. Mike Frale of Elk Grove Village provides musical direction. Working behind the scenes are Jamie Voustros of Chicago (stage manager), Katie Szymkiewicz of Chicago (assistant stage manager), Julia Egizio of Plainfield (properties manager), Mike Nutter of La Grange (light board operator), Zue Balquin of New Lenox (sound designer and operator), and Dave Pomatto of Naperville (assistant technical director). The front-of-house staff are Hannah Krause of Mazon (box office assistant) and Joram Haddad of Naperville. "Peter and the Starcatcher" will be performed on April 12-14 and April 25-28 and is recommended for patrons of all ages. Evening performances are 8 p.m. and the Sunday matinees are 2:30 p.m. In addition, there is a 4 p.m. matinee performance on April 27. Advanced ticket purchases are strongly encouraged. Ticket prices are $12.25 for an adult, $11.25 for students and seniors. Lewis students pay $2.25 with an ID. Group tickets are available for parties of 15 or more. Running time of the show is approximately 2 hours and 30 minutes with an intermission. Tickets are non-refundable. For more information, patrons can follow PLT on social media @pltlewisu, call the box office (815) 836-5500 Monday through Friday 1-4:30 p.m., or credit card purchase on the PLT Website at www.lewisu.edu/plt. The theatre is located on the main campus in the Oremus Fine Arts Center on Route 53, Romeoville.